Storey Publishing, LLC, 2013. Paperback. Good. Disclaimer:A copy that has been read, but remains in clean condition. All pages are intact, and the cover is intact. The spine may show signs of wear. Pages can include limited notes and highlighting, and the copy can include previous owner inscriptions. An ex-library book and may have standard library stamps and/or stickers. At ThriftBooks, our motto is: Read More, Spend Less.Dust jacket quality is not guaranteed. Storey Publishing, LLC, 2013. Paperback. Acceptable. Disclaimer:A readable copy. All pages are intact, and the cover is intact. Pages can include considerable notes-in pen or highlighter-but the notes cannot obscure the text. At ThriftBooks, our motto is: Read More, Spend Less.Dust jacket quality is not guaranteed. Storey Publishing, LLC, 2013. Paperback. Very Good. Disclaimer:A copy that has been read, but remains in excellent condition. Pages are intact and are not marred by notes or highlighting, but may contain a neat previous owner name. The spine remains undamaged. At ThriftBooks, our motto is: Read More, Spend Less.Dust jacket quality is not guaranteed. Storey Publishing, LLC. Used - Good. Former Library book. Shows some signs of wear, and may have some markings on the inside. Storey Publishing, LLC. 1612120512 LIKE NEW!!! Has a small black line on edge of pages. . Fine. 1899-12-30. Storey Publishing, LLC. PAPERBACK. 1612120512 Cover has a crease. Moderate wear to corners/ edges. . Good. Storey Publishing, LLC, 2013-09-11. Paperback. Good. Storey Publishing, LLC. PAPERBACK. 1612120512 Remainder mark . Fine. Storey Publishing, LLC. PAPERBACK. 1612120512 . New. North Adams Ma: Storey. 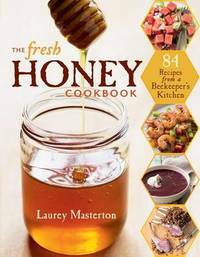 "84 recipes from a beekeeper's kitchen" NEW copy unused. Fresh covers/text. No remainder or other markings. Size: 8vo . As New. PaperBack. 1st.. 2013. Storey Publishing, LLC. PAPERBACK. 1612120512 BRAND NEW, GIFT QUALITY! NOT OVERSTOCKS OR MARKED UP REMAINDERS! DIRECT FROM THE PUBLISHER!|1.19 . New. Storey Publishing, LLC. PAPERBACK. 1612120512 *LIKE NEW* Ships Same Day or Next! . Fine. Storey Publishing, LLC. PAPERBACK. 1612120512 *BRAND NEW* Ships Same Day or Next! . New. Storey Publishing, LLC, 2013-09-10. Paperback. Used:Good. Storey Publishing, LLC. PAPERBACK. 1612120512 Special order direct from the distributor . New. Paperback. New. Honey is one of nature's most versatile ingredients. Prized as a natural sweetener and also known for boosting energy, strengthening the immune system and alleviating ailments from insomnia to sore throats, it's a bonus that honey also tastes so good. This book gives honey bees their due with informative sidebars about bees and beekeeping. 2013-09-01. Good. Ships with Tracking Number! INTERNATIONAL WORLDWIDE Shipping available. May not contain Access Codes or Supplements. May be ex-library. Shipping & Handling by region. Buy with confidence, excellent customer service! Storey Publishing, LLC. PAPERBACK. 1612120512 Like New Condition. . Fine.